This weekend has involved a lot of cake. For someone who is supposed to be on a pre-holiday healthy eating kick, it was probably filled with too much cake. But you can’t turn down special occasion cake can you? And if that special occasion happens to just be a friday afternoon, then so be it. Life is all about celebrating the little moments. In addition to the friday afternoon cake pictured here, more of which later, I spent most of the weekend engaged in a father’s day baking extravaganza for my parents and my boyfriend’s parents who were all invited for afternoon tea. There were Nigella’s flourless brownies, a Victoria sponge and some lemon cupcakes which I won’t link to because they were pretty disappointing. When planning the menu, I hadn’t realised what a grammatical minefield I would be crossing with my brownies. As there were going to be 16 brownies, I decided to use them to spell out ‘Happy Father’s Day’ and ice a letter on each one. A lively twitter debate then ensued as to whether ‘Father’ should be singular (to represent fathers everywhere) or plural (because there were two fathers present). I should just add here that I love and appreciate the seriousness with which my friends entered into this conversation, it warmed my heart even if it didn’t provide me with an answer. In the end, I solved the dilemma by eating the apostrophe brownie. All of those cakes were delicious in their own ways but I really wanted to talk about this raspberry and almond cake. I found some English raspberries in a local shop and I pounced on them. Well, I didn’t actually pounce on them because I’m English but I asked very politely if I could have some raspberries which is almost the same. I had a vague plan for a cake, tender with ground almonds, rich with olive oil and full of jammy pockets (with thanks to Kathryne for a phrase that’s been haunting me since I read it). In some recipes, the substitution of ground almonds for some of the flour can work very nicely. I’ve never been able to replace more than about a quarter of the flour without causing some severe structural damage to the cake but a little can go a long way. I think it is particularly good in a recipe like this where you’re using whole grains but where you don’t want too robust a texture or taste from the flour. 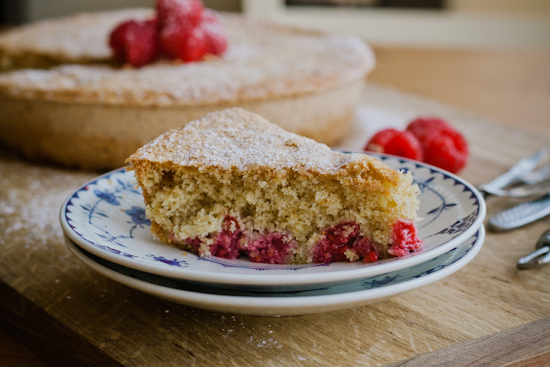 The combination of ground almonds and olive oil creates a dense but light crumb, sturdy enough to tranport the raspberries but not too heavy for it to be a perfect summer cake. You can serve this with a dollop of creme or creme fraiche but this cake more than holds its own without. Preheat the oven to 160C/325F and well grease a 23cm tin with butter. In a large bowl or the bowl of a stand mixer, whisk together the eggs and sugar until the mixture is light and fluffy and has tripled in size (at least 5 minutes, probably closer to 10). Pour in the olive oil and vanilla and continue to whisk until it has been incorporated. Fold the flour and ground almonds into the mixture with a metal spoon, trying not to lose any of the air. Finally fold in the raspberries. Pour into the tin* and bake for 35-40 minutes until the cake is golden brown and starting to shrink from the edges of the tin. Leave to cool in the tin for 10 minutes before transferring to a wire rack. 36 Responses to "raspberry and almond olive oil cake"
I love the idea of substituting some ground almonds for the flour! This looks so beautiful. I’m supposed to be on a pre-holiday healthy eating kick also! And failing. Miserably. I think I’ll fail some more and make this cake. Looks so delicious! Reading about how you solved your gramatical dilemma made me laugh! What a delicious way to solve the problem!! If only all problems could be solved this way. I love fresh raspberries. This cake looks amazing! @Ali – It’s really nice in a cake like this because it gives an awesome texture to the cake. @Jennifer – My dad actually asked why there wasn’t an apostrophe so it wasn’t quite the genius solution I thought but it was definitely a tasty one! Goodness, yes please. This looks amazing. And your posts always [always!] make me laugh. I love them. Boy am I glad you ‘pounced’ on these raspberries. Beautiful cake!! @Karen – Thank you, I hope you like it! Raspberries sing sweet promises of summer to me! I ate practically an entire large carton by myself this weekend. Gorgeous photographs! I must try baking with almond flour. This looks (and sounds!) so stunning Kathryn! @Renée – Despite the awful weather, I did feel so summery when I saw them in the shop! @Jay – Thanks for stopping by! @Cassie – Thank you so much Cassie, you always leave the nicest comments! Looooove the look of this! This cake is so classic and appealing to me, Kathryn! And I love your posts–they make me smile. 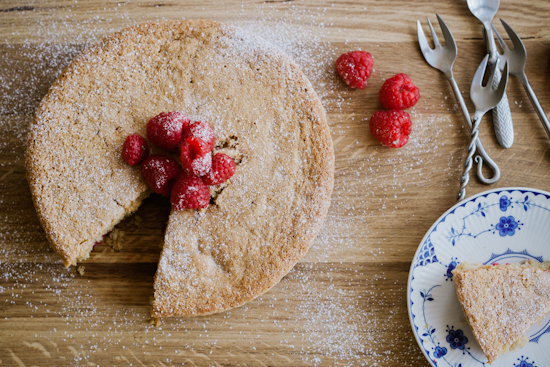 I am an almond cake lover and raspberries only make it even lovelier! I’ve never baked with almond flours but it sounds really delectable and I love the raspberry/almond combination you brought into this lovely looking cake!! I am always in the mood for cake. This looks fab. @Rosie – Thank you for such a lovely comment, I’m so glad you like the cake. The almonds work so well at really making the flavour of the raspberries sing. @Julie – It’s really good in cakes like this because it keeps them from being too heavy or dry and just adds a slightly different texture and depth of flavour. @Jen – Yes, I’m telling myself it’s semi-healthy too. Fruit, whole grains, olive oil…what more could you want? They say that you should celebrate each day, so why not to do it with this cake :) I like the raspberry bottom and all the pictures of course. i am seeing olive oil cakes EVERYWHERE lately! guess it’s time for me to make one, too. @Marta – That is very much my philosophy! @brandi – Funny isn’t it? I saw Jennifer Perillo posted a lemon one (that I really want to try!) today as well. They have a slightly different texture to cakes made with butter and I think they can be a bit more sturdy which makes them great for additions like fruit. @amy – Your input was much appreciated! @Texanerin – Oh that’s the best reaction ever! I’m so glad you like it :) And yes, frozen raspberries will be great too. I think I’m going to freeze a batch so I can have this cake again in the winter and pretend it’s summer outside! This is a sensational looking cake, Kathryn! I love your simple approach to baking… very much like mine. :) Thanks for sharing this wonderful springtime dessert! I’ve made olive oil muffins before and I absolutely loved it so I’m sure I’ll love this just as much, if not more. Awesome recipe! I LOVE the ingredients! I have been secretly wanting to make an almond-y flavored cake, so this is just perfect! The olive oil add such great depth of flavor, too. So pretty! Love the flavor combination here. You had me at ‘jammy pockets’. Yum. I came back to check out the ingredient list and noticed your forks. I’m so jealous! Lovely forks. What a strange thing to compliment, but really, those are the neatest forks ever. @Georgia – Thank you so much, so glad you like it! @Chung-Ah – I think olive oil muffins will be my next experiment! @Chrissy – Aw thank you so much – I think a little almond extract instead of the vanilla would be awesome too! @thelittleloaf – I know, isn’t it a great phrase? @Erin – Lol, you are not the first person to compliment the forks! They were actually from a French supermarket but they are the best props ever!